It’s been awhile since I’ve shared a guest post; a whole lot of life has happened. But, today I get to host my friend Deborah Stambaugh, and that is a very exciting thing. I met Deborah officially when we were college freshmen–but I probably should have met her many years before that. We went to the same church camp every summer in Mountainair, NM (some of you know exactly what I’m talking about) and I remember seeing her and her three sisters and thinking how beautiful and cool they were (I was right–they are). Deborah might be part of the reason I married who I did–I do know she saw the potential for our relationship long before I did. So thanks for that tremendous gift, Deb. And thanks for helping me laugh at myself, for modeling bravery, for glasses of “water” to drink around bonfires and glasses of iced coffee to drink in boring classes. I’ve always learned from your generosity. Hope you all enjoy her words today, and can find a way to breathe deep and trust the process you’re in. I’ll be doing the same. Happy almost Easter! When James led us to the Episcopal tradition, many friends and relatives asked why. His answer always started with the church calendar. That was boring (and certainly the last topic that could ever be blog-worthy) so I often interjected my own response. After many cycles of the calendar, I am beginning to understand. It all started in Advent. Looking for coffee in the great hall at St. John’s Cathedral, I found the smell of cut pine, families bustling to assemble their advent wreaths, glitter and cut ribbon all over the floor, and bystanders drinking coffee and enjoying the hubbub. “You should make one,” James (my husband) offered. He drank coffee and chatted instead of helping me. So, I vindictively put glitter ribbon all over it. He hates glitter. He said it was beautiful. I thought, “There must be something to this Advent thing if it can make him like glitter.” Inspired by the wreath, James invited our neighbors to our house. He said a short, but lovely, prayer and cooked a beautiful meal, which we enjoyed by the light of the first candle–a tradition we continue. I paid no attention to the calendar until Lent approached and people asked what would be my Lenten discipline. I retorted that I would stop “walking Central” and smoking cigarettes, but only for Lent, and that I would not give up the pole dancing gig! Secretly, or not so secretly, I was repulsed by the idea of Lent. Sometime during that first Lent I do remember thinking that Rev. Goodman was finally preaching proper sermons—about abstaining from sin and committing your life to God because Jesus sacrificed so much for you. On my first Pentecost it seemed every woman at church wore a red hat, except me. There are colors to coincide with each season of the church calendar. Ordinary time is green. James likes to wear Converse All-stars to match the color of the season. Ordinary time is the longest season, so his feet smell awful by the end of it. The glitter wreath, my abstinence from abstaining, my black dress in a sea of red, and James’ stinky feet were all I truly understood during that first cycle of the church calendar. When Lent came around a second time, Rev. Goodman’s sermons sounded familiar (like real church) again. This time, equipped with the experience of feeling (though in a rudimentary way) other seasons, I understood why the sermons were familiar—because it was Lent. Then I realized, “I hate Lent because I’ve done 20 years of it.” An evangelical emphasis on holiness combined with my own religious ambition resulted in a continuous effort to memorize scripture, pray, abstain, and otherwise improve myself so that I could be the best Christian possible and obtain a lofty status in the Kingdom of God. It exhausted me. Instead of becoming more Christ-like, abstinence made me judgmental and proud. I gave myself several years of ordinary time. Thankfully the Cathedral completely and utterly welcomed me in spite of my lack of enthusiasm. Slowly a thirst for renewed spirituality burgeoned within me. James was assigned to help at a small parish that did not have volunteers to prepare and clean up communion. After service he wetted the wine-stained church linens, put them in a plastic bag, brought them home, and left them on the counter to rot. Three days passed. Then four. My options were to throw out the whole mess or attempt to salvage it. I dug out my Oxyclean and an old tooth brush. While working on the linens, it dawned on me that I was participating in an ancient tradition. Though separated by 2,000 years of time, I was working together (in a symbolic or possibly more than symbolic way) with the people who performed the most honorable task of preparing the corpse of Christ for burial. I thought about them. I participated in their grief. I wondered what thoughts they had as they tended the vacant and mutilated body, whether they were mad at him, knowing he didn’t even put up a fight. Were they mad at the authorities who caused his death? Did they dare hope for a resurrection? How horrible it must have been to grieve without the hope I have in the resurrection. Luckily it was only three days. I wished I could share my Oxyclean and washing machine with them. Somehow cleaning linens made Christ and his people more real to me. I understood the value of early church traditions, and decided to participate. Each year as we circle around the calendar, I gain a deeper understanding and appreciation of the celebrations. Each year my participation is seasoned by my own life experiences. Jane, the Cathedral’s former Christian Education director, hung a bell on my son Edmund’s wrist the year he had the role of Jesus in the Christmas play. Nora, my daughter, had that honor last Christmas, and I stole a bell from the Cathedral to put on her wrist. I will hang those bells on my Christmas tree every year until I die, and remember with joy the births of my children and THE BIRTH we used the bells to celebrate. 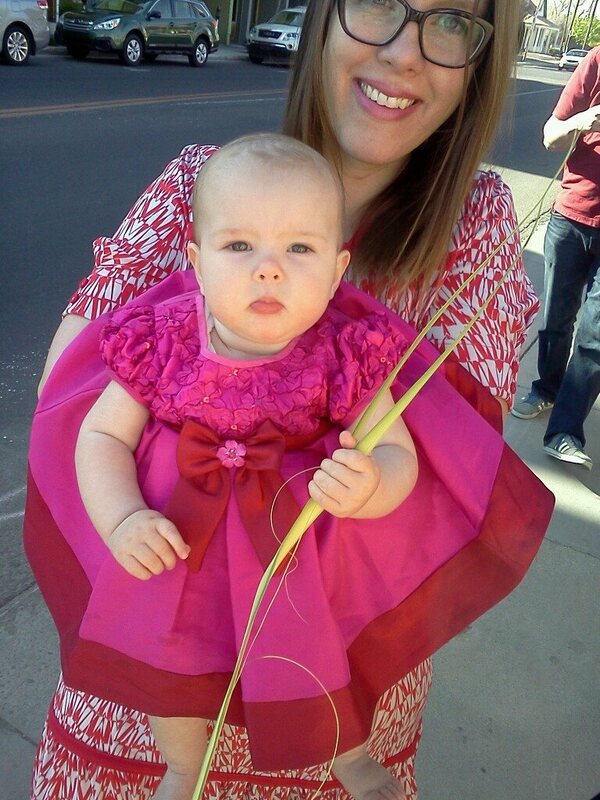 Last Sunday we waved palm branches and processed around the neighborhood. I told Edmund about Jesus coming to Jerusalem 2,000 years ago, and about how everyone was so excited they put palm branches on the ground for his colt to walk upon. I refrained from sharing the rest of the story. He will hear it in due season in accordance with the calendar. I will probably wear jeans on Pentecost as a way to welcome others who don’t know about the red hat thing. But you can rest assured I will have a beautiful green hat for ordinary time…and maybe some Oxyclean for those nasty green shoes. Deb is a wife of nine years, a mother of two small children, and an attorney in Albuquerque, New Mexico who drinks way too much coffee. She enjoys estate sale shopping with her husband and long walks. Thank you, Deb, for helping me see anew my Episcopal Church. Spending almost every Sunday of my almost 50 years (+ 9 months) at church it seems I’ve lost some of that wonder and freshness you get to experience. Your thoughts have also brought happy tears of memories of my own mother (resting in God’s Peace) teaching me the same glorious traditions you’re getting to teach your children. I am so very glad you and James chose our Cathedral to help you raise your family, and I’m so very lucky to get to walk a few steps behind you both as we progress along the Path that is offered before us. And thank you Emily for sharing Deb’s thoughts.